On Saturday, 29th March 2014, the Ministry of Education, Employment and Gender Affairs hosted the first National Conference on Women. Through an interactive agenda, participants shared their experiences and perspectives on a wide range of issues – from sports, health and family planning to employment, human rights and participation in political and public life. Solutions and strategies to promote greater gender equality were also sought during the candid focus group discussions. The Ministry has published the Conference Report and launched a wider public consultation exercise to gather additional perspectives about the situation of women and girls in the Cayman Islands. A questionnaire has been produced to guide feedback and the Ministry will also host an event in Cayman Brac to address the special circumstances of women and girls living in the Sister Islands. 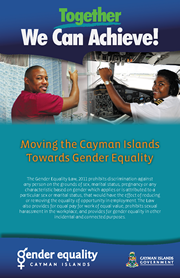 In anticipation of a favourable response to the Cayman Islands Government’s request for the United Kingdom to extend the United Nations Convention on the Elimination of All Forms of Discrimination against Women (CEDAW), the qualitative data gathered will be used to inform the local implementation plan for this international human rights treaty by identifying priority issues and strategies to address lingering discrimination in local legislation, policies and practices. All Cayman Islands residents are invited to participate in this broad public consultation exercise and submit written comments on the situation of girls and women by Monday, 30th June 2014. 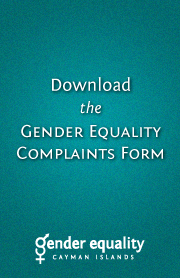 The National Conference on Women report, public consultation questionnaire and additional information and guidance are available online or in hard copy from the Government Administration Building. 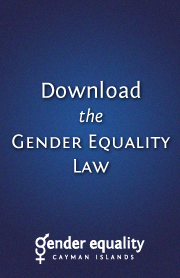 For more information, please contact the Gender Affairs Unit at genderequality@gov.ky or on 244-3226.